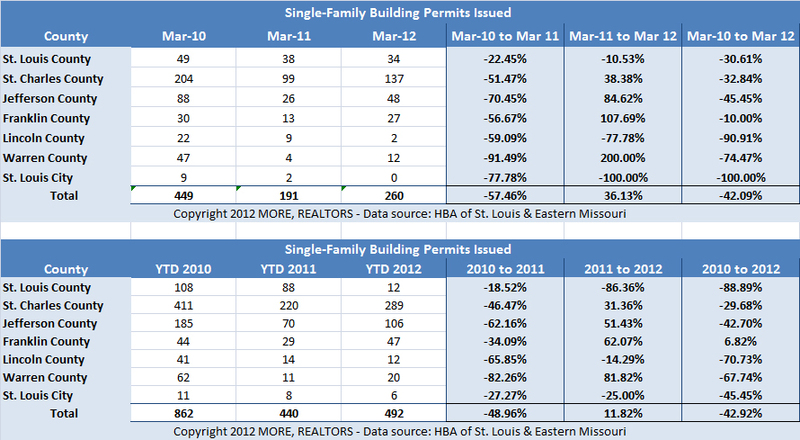 The Home Builders Association of St. Louis & Eastern Missouri just released their single family building permit data for March 2012 which shows an increase in activity from March 2011 for most of the St. Louis area. St. Louis City and County both saw declines in permit activity with 6 permits fewer issued total for the two than the year before, but this was more than made up for by St. Charles County increase of 38 permits which helped bring the total permits for the 7 St. Louis Counties covered by the HBA report to 260 for the month, an increase of over 36 percent from March 2011 when there were 191 permits issued. The HBA report shows ytd (through the end of March) there have been 492 single-family building permits issued in the St. Louis area, an increase of almost 12 percent from this same time last year when the year to date total was 440. In spite of the increases in permit activity, the entire St Louis area, with the exception of Franklin County, is still down significantly from 2010 with the overall decline coming in at almost 43 percent.